Start with a flat bottomed skillet, one with a lid. Warm up some oil and add in the garlic and red chili flakes. Throw in the onions and cook until soft. Season with salt and black pepper. Add in the kale and stir around to combine flavors and season. Lower the heat and cover. After the kale has wilted down, using the back of a spoon, carefully make “nests” into the kale. Even more carefully, crack an egg into each of these nests. Sprinkle eggs with salt and pepper. Cover and cook for 2-3 minutes or until the tops of the eggs have set. 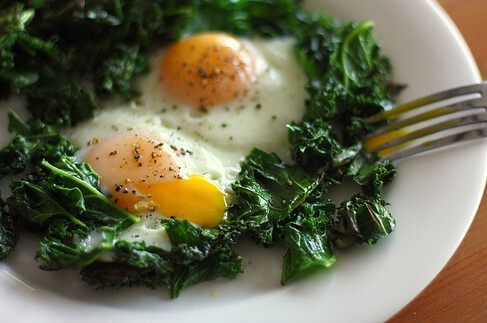 To serve, fill your bowl with warm brown rice and scoop a heaping “nest” on top, kale and egg. If you’d like, squeeze some lemon juice onto the greens. Crack the yolk with your spoon and enjoy!